Women's Saddle Country Shirt Jacket is rated 4.7 out of 5 by 138. 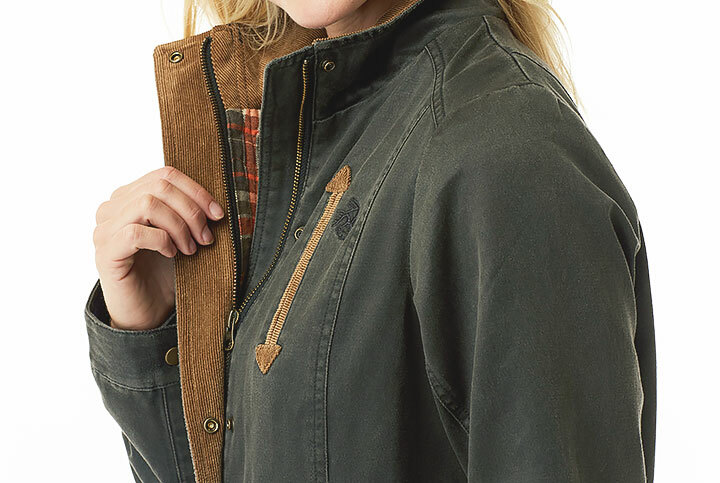 Flannel and corduroy—it's a match made in hunting heaven! 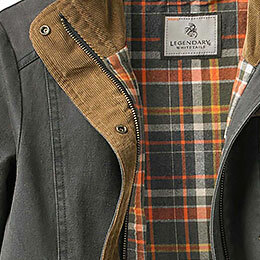 Soft, warm, and subtly stylish, plaid flannel lining and corduroy trim make this Country Shirt Jacket irresistible. We made the back slightly longer than the front of this shirt jac for extra coverage when you're walking the dog. Need a rest? Even better, because there's a little bit more fabric between you and that cold bench you just sat on! Tough enough for chores, but styled for a night out! A durable soft washed waxed cotton/poly blend shell that is lined with a brushed 100% cotton flannel. 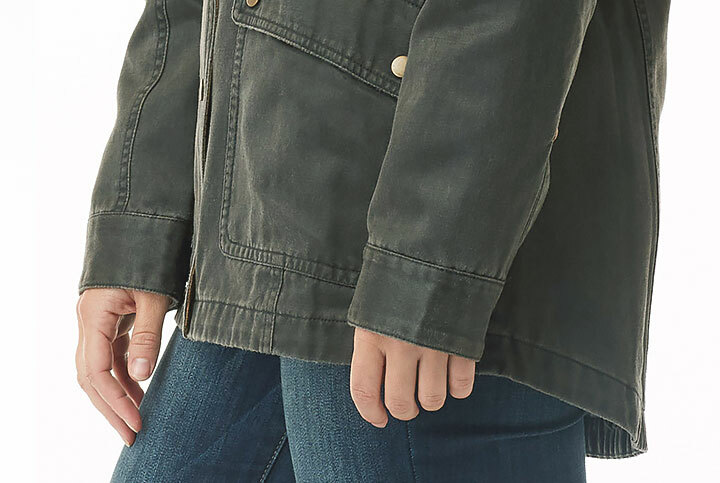 Featuring a heavy-duty zipper with snap down storm flap, drop tail back, big cargo pockets with flaps, and flannel lined hand warming pockets. 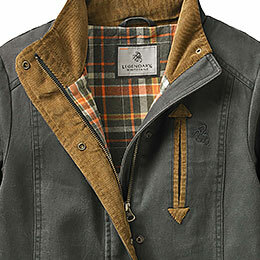 Finished with corduroy accents, debossed antique brass buck tag, and Signature Buck embroidery. Rated 3 out of 5 by BAMM from XXL not 2X I love this shirt jacket, but had to return it. The XXL size is too tight in the chest. Please make this in your 1X & 2X sizes! Nice flannel and heavy cotton. Rated 5 out of 5 by Jamie from The perfect lightweight jacket! This is a great, lightweight jacket! Very high quality and just enough warmth. I love the color too. It matches everything! Rated 5 out of 5 by Deb Lucas from Review The service was great the shipping took no time at all. I love the shirt great quality. What are the sleeve lengths of the medium and large of this coat? On a scale of 1 to 10 how warm will this jacket keep me? Like does it compare to a Carhartt coat? Is the coat water resistant? Will you be offering this jacket in more sizes? 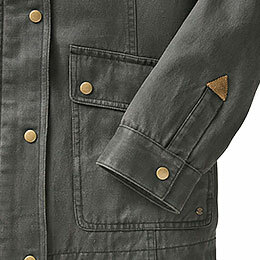 This is perfect for my chore jacket and I've been looking for a barn coat like this for a long time. Thank you and have a blessed day. 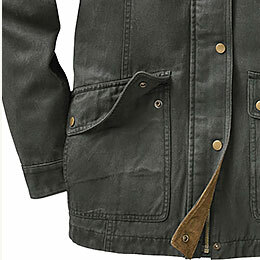 We are expecting an updated version of the Saddle Country Shirt Jacket in mid-summer. Please keep an eye on the website - as soon as this jacket is available again, the website will be the first place to reflect that. What size range does the medium typically fit? The Medium is a size 8-10. The bust is 36-37&quot;, waist is 29 1/2-30 1/2&quot;, and hips are 38 1/2-39 1/2&quot;. When will size medium or large be back in stock? How true to size is this jacket? Does it run small/large?? According to our other customer reviews, this jacket does run true-to-size. Does this jacket come in other colors at this time or will in future? Currently, there are no plans to offer this jacket in different colors. However, I am happy to pass along the suggestion to our Product Development team!